June 28, 2018, 6:50 PM · Welcome to "For the Record," Violinist.com's weekly roundup of new releases of recordings by violinists, violists, cellists and other classical musicians. We hope it helps you keep track of your favorite artists, as well as find some new ones to add to your listening! Joshua Bell. Photo by Cindy Ord for Recording Academy®/WireImage.com © 2018. From concert Wednesday night for the Recording Academy New York Chapter which featured Bell performing with alumni from The NationalYoung Arts Foundation as well as pianist Alessio Bax. This album features Joshua Bell’s first recording of Bruch's Scottish Fantasy as well as a new recording of the Violin Concerto No. 1 in G minor, which he first recorded more than 30 years ago with the Academy of St Martin in the Fields and Sir Neville Marriner. Now, as Music Director of the Academy, Bell both performs and directs the orchestra. Bell said that the Scottish Fantasy has become a favorite performance piece for him in recent years: "My father’s descendants were from Scotland, and I grew up hearing stories about how my great-grandfather and great-great-grandfather fought in the Black Watch in Scotland," Bell said. "My dad was proud of his Scottish heritage, and this connection makes the melodies in Bruch’s Scottish Fantasy even more meaningful to me. It is one of the most beautiful and touching pieces I know, and so brilliantly orchestrated. It is a unique ‘concerto,’ not following the traditional three-movement form. Each of its four movements tells a story." BELOW: The Making of Scottish Fantasy. "We can’t have joy without sadness. We can’t be whole without knowing our brokenness. Each of the composers on this record has offered their own beautiful, vulnerable response to a sadness. Let us learn to mourn every day a little. To help heal ourselves, each other, and this world," said violist Jonah Sirota of his inspiration for his album, which features new elegies by eight composers: Sirota himself, Paola Prestini, Nico Muhly, Valgeir Sigur?sson, Robert Sirota, A.J. McCaffrey, and Rodney Lister, and the improv duo Mondegreen (Jonah Sirota and Kurt Knecht). BELOW: Excerpts from the album. Duo Odéon, which consists of violinist Hannah Leland and pianist Aimee Fincher, performs works by American composer George Antheil (1900-1959). The recording is the result of the Duo’s four-year collaboration in performing and researching the music of George Antheil, and highlights music Antheil composed for his friend, German-born violinist Werner Gebauer (1918-2013). Works include the Sonatina for Violin and Piano; Concerto for Violin and Orchestra (world premiere recording of the piano reduction); and the recently discovered Valses from “Specter of the Rose,” arranged by Gebauer, in its world premiere recording. 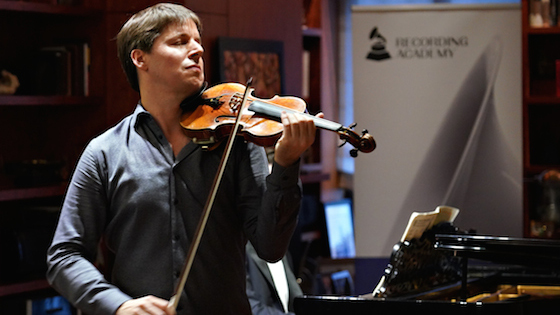 "In the fall of 2016, we received an email from our friend in Switzerland, the scholar Mauro Piccinini, informing us of a newly discovered Antheil work for violin and piano, found amongst the late violinist Werner Gebauer’s papers," writes the Duo in their introduction to the recording. "Marc Gebauer, his son, had unearthed a set of three short waltzes, Valses from 'Specter of the Rose,' an arrangement of music from Antheil’s 1947 film score for Specter of the Rose. As we studied Gebauer’s Valses, we learned that Antheil and Gebauer’s relationship extended far beyond successful musical collaboration into friendship, mirroring our own musical relationship." BELOW: Valses from Specter of the Rose: Maestoso.